New York City Rug Repair – Restoring and repairing your antique rugs in the New York City area just got a whole lot easier! Whether a heirloom, specialty made, antique, or artisan, antique and vintage rugs are an investment. Hours upon hours were devoted to crafting these beautiful works of textile art. As such, they deserves proper care and attention from owners to prolong the rug’s health for decades to come. 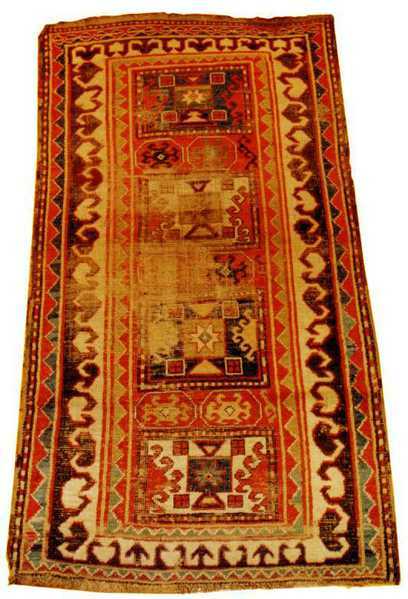 Nazmiyal Antique Rugs offers expert Oriental rug restoration and carpet repair serves. We can easily tackle any size restoration project and are easily accessible from Manhattan or any of the 5 New York City Boroughs, Long Island, Westchester County of New York State and Fairfield County of Connecticut areas. We’ve been in business since 1980 and can help with Persian rug repairs, Oriental rug cleanings, stain removals and all aspects of antique rug restorations. 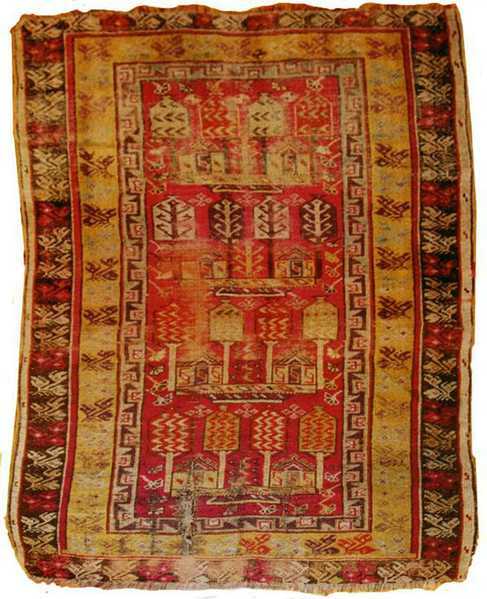 We have solidified our expertise, knowledge, and craft of handling an array of fine restoration of textiles and rugs. While we most of our rug restoration services are done for people that live in the greater New York City area, if it is a bigger repair project, you always have the option of shipping the rug to us for inspection and an estimate. All of the above restoration and repair services will help to preserve the beauty and longevity of your rugs for years to come. Even restoring hand woven antique textiles aren’t a problem. When done properly, your rug and carpet repairs will be almost undetectable. And, rest assured that, whether it’s an antique tapestry or an antique area rug, all restoration projects will be handled with the upmost care and will be skillfully repaired by a professional rug restoration expert. What If The Rug Can’t Be Repaired Or Isn’t Worth The Cost? An informed client is the best client. Before any action is taken, clients are provided an upfront with an estimate of repair and repair. A detailed explanation of service by our professional rug repair experts and we will also indicate if we feel that investing the money into restoring the rug is worth while from a financial point of view. We understand that some rugs have sentimental value which money cant buy, and while some rugs may not justify the cost of the restoration, if the client still wants to move forward with it, we will gladly take on the restoration project. This allows the client to make an informed decision on the restoration cost verses the rug’s value. Where do you restore and repair the rugs? For the most part, we will do the restoration and repair at our Manhattan NYC rug gallery. That said, for much larger projects, there’s also the option to ship the item to overseas for professional repair. The quality of the repair will remain, but the cost of repair is relatively cheaper than in the U.S. That said, the repair job will need to be substantiation enough to warrant the extra shipping and handling expenses that are associated with sending rugs overseas to be restored. Q: Can a rug’s fringes be repaired? A: Yes, undone fringes can be bound and repaired. The main caveat is that one will need to address the fringe repairs as soon as possible to keep the cost down. The more the fringes unravel, the more costly the repair, especially if the unraveling extends into the pile of the rug. Please note that the fringes of the rug do not affect the value of the rug. Q: What’s the difference between rug restoration and rug repair? A: For the most part, people use the terms “repair” and “restoration” interchangeably. That said, a rug repair job will tend to address a specific problem or problems. Addressing and fixing only those specific areas is considered to be a rug repair job. That is because we will not be restoring the entire carpet to an original state. *With that said, rug restoration may also refer to fixing a specific problem, or it may involve restoring the entire carpet (depending on what needs to be done). In either case, a restoration project will bring the piece back to its original state (or those specifically restored areas). Q: Can a patch be used to repair a hole in my rug? A: To save time and money, patches may be used to make rug repairs. That said, nothing will look as good as actually rebuilding the foundation and re-piling the area to match the design and texture. 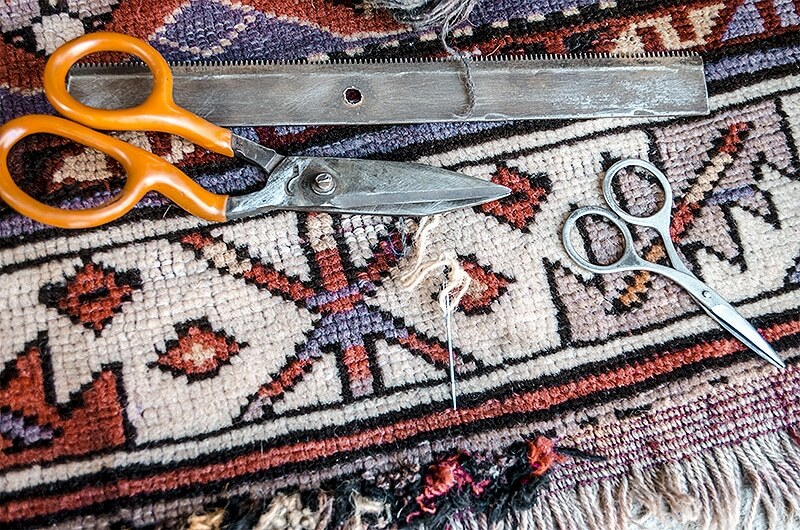 Q: What does it cost to repair or restore a rug or kilim? A: The short answer to that questions is – “it depends on the piece and what needs to be done”. Each carpet of kilim is unique not to mention the fact that no two restoration projects are the same. The restoration costs will vary based on the extent of damage, the quality of the rug and a whole slew of other factors. It’s all but impossible, not to mention highly unfair to customers, to place a one price fits all cost on carpet repairs and restorations. 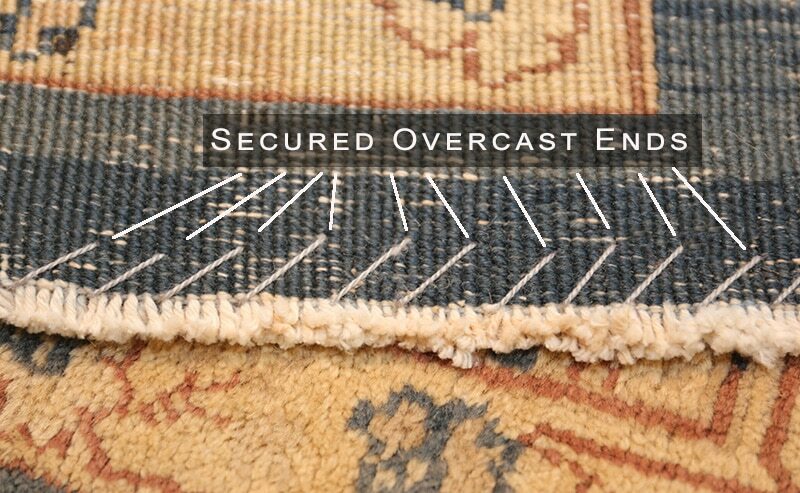 *We suggest to avoid any entity that does provide such a generalized price point for all or any rug repairs. 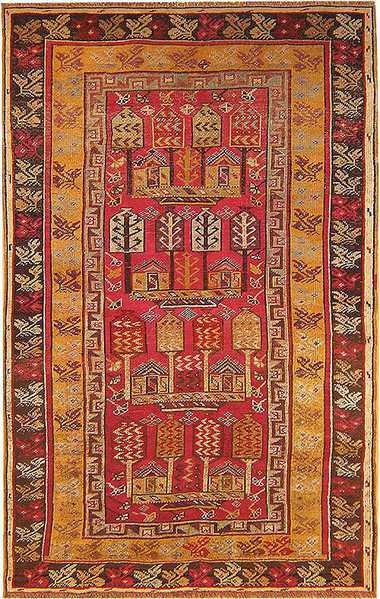 Look for a free, no obligation estimate, such as provided by the expert rug professionals at Nazmiyal Antique Rugs in Manhattan, New York City. 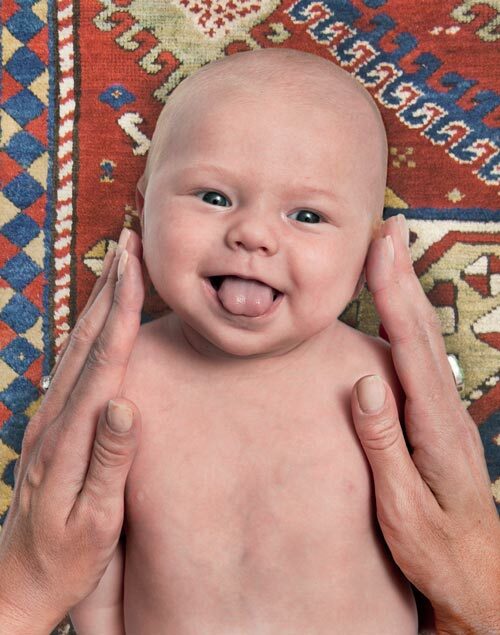 Q: What are some common damages that rugs tend suffer? A: The most common types of rug repairs tend to be rips, fraying, holes, thinning, color / sun fading, stretching, fringe damage, water damage, moth damage, fire damage, stains, and rugs that need to be resized to fit a new space. All these “damages” can be mended and repaired. However, in many cases (such as moth damaged rugs), the carpets will need to be professionally cleaned before any repairs are made. Q: Why must rug be cleaned before the are restored? A: There are many reasons why carpets should be washed before the restoration and repair services can begin. For example, the washing process will kill all the moth larvae and eggs so that once the repair is complete, you will not have any more of the critters eating the wool pile of your rug. Another reason is that dust will make the reweaving process much more difficult. In addition, cleaning the rug will bring up the colors so that they could be matched much better. 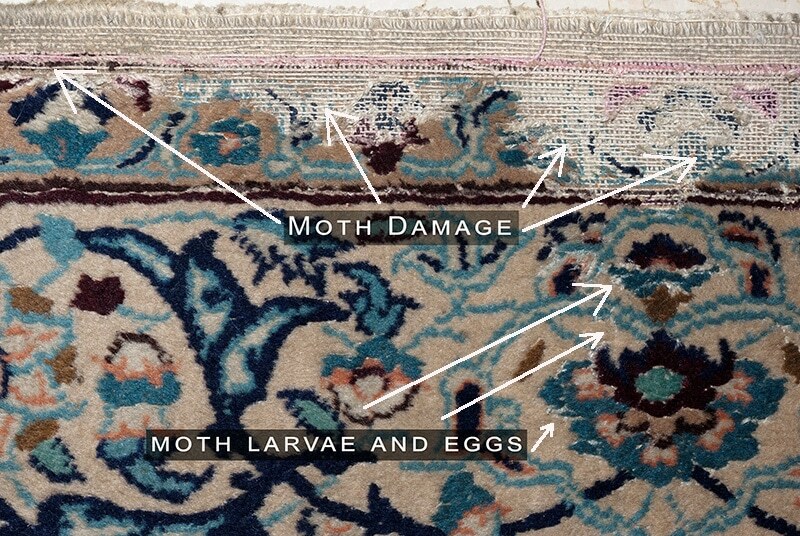 Q: Are rugs with wool foundations more susceptible to moth damage? A: Indeed. Rugs with cotton foundations are less prone to moth damages than those with wool foundations. Moths as well as other types of insects will generally prefer animal fibers such as wool to vegetable fibers such as cotton. If you have cotton rugs and see holes, those are more likely to have been the result of improper use or care. Regardless, either case is surly repairable and the foundation will need to be rebuilt if the hole is extensive, however. Q: What types of rugs can be repaired and cleaned? A: Almost any handmade rug can be professionally cleaned and repaired, including kilims, Oriental rugs, Persian carpets, Navajos, Dhurries and so forth. Oriental rugs add much aesthetic value to the overall appeal and uniqueness of your home’s interior design. 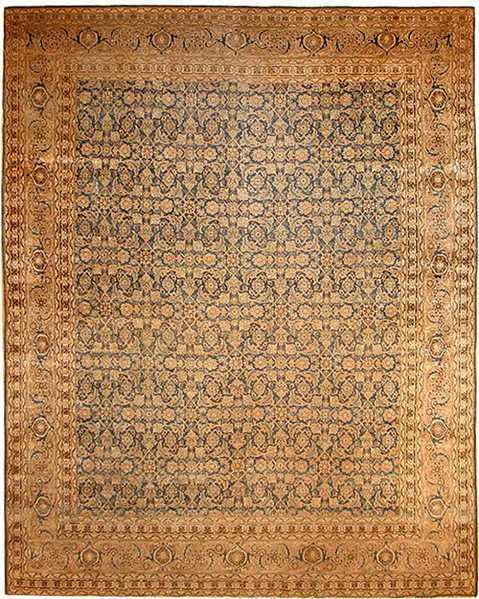 Some of the rarest rugs are also investments. Like any other type of investment piece, investment caliber rugs require proper care and maintenance to preserve their value and beauty. The nature of its everyday usage lends to normal wear and tear damage from traffic, spills, heavy furniture dents, dust, insect damage and so forth. This is true even in cases of the most attentive rug owner. Of course, regular routine maintenance and cleaning can help preserve. That said, some wear and tear damages may require actual rug repair and restoration services to offset the effects and prevent further damages. The rug has been damaged – what now? Follow these two steps to ensure the best chance of repair … at the lowest cost. Swiftly acting to restore a rug prevents further deterioration and damage. If ignored, a simple, inexpensive damage can quickly turn into a costly, elaborate, or possibly irreversible damage. Choose a reputable rug repair service. Yes, they may be more costly, but the quality and expertise of repairs are a worthy cost for such a valuable possession. Keep in mind that the cost is relative to the tedious and time consuming work it takes a master rug restorer to repair the rug. These professional rug repair professionals will pay attention to even the smallest of details. This attention to detail can make a huge impact on the finished results of the restoration. They take the care to ensure the weave, dye and wool will all match as perfectly as possible. This approach will preserves the character of the piece. Most importantly, professional rug restorers will never suggest a repair tactic that decreases the value and originality of the rug (unless the client asks for a much cheaper estimate and is made aware of any potential drawbacks). Some cheaper repair services are cheap because they engage in just such practices. For example, carpet restorers may suggest that holes and worn areas be painted instead of rewoven or re-piled. Not only does this approach compromise the integrity of the rug, tinting a rug extensively will adversely affect the value. An expert would never make such a suggestion to a rug owner unless the client specifically requests such an approach and is made aware of the repercussions. A master rug weaver can look at the rug and provide customers with a detailed explanation of what must, should and could be done to repair, restore and preserve the integrity of the rug. What Are Some Common Repairs Oriental Rugs May Need? Outside of accidental and catastrophic damages, such as fires and floods, the most common repairs are related to everyday wear and tear. It’s usually the sides and ends that weaken first from everyday use. Do keep in mind that as these weaken, it leaves the rug at risk of unraveling. This may result in damage to the pile itself if not promptly repaired. These bindings run lengthwise and are the outermost areas on both sides of the rug that do not have fringe. There’s an endpoint along the side since Oriental rugs are generally woven across the foundation warps in a side to side fashion. That end point is tied and prevents the rug from unraveling. With time, the end sometimes becomes loose from normal wear and tear by traffic and can open up. If not promptly addressed, the binding could continue to open , creating more and more extensive and costly damages. The rug repairer will wrap the damaged side with wool to match the type and color of the rug. Narrow, fine, tight edges are used for finer piles and a more coarse edge is used for thicker piles. 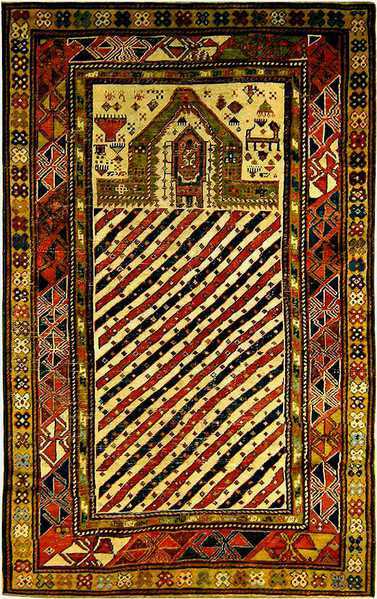 The ends of the rug are made up the two crosswise, fringed ends running the width of the carpet. Despite appearing like mere adornment for looks alone, if the fringe ends are original, then they actually the rug’s foundation (each thread or strand will run from one end of the rug all the way to the other end). The fringed ends are exposed and unsupported, leaving them highly susceptible to damages. Master rug weavers use their own preferred technique to repair the rug’s fringe. 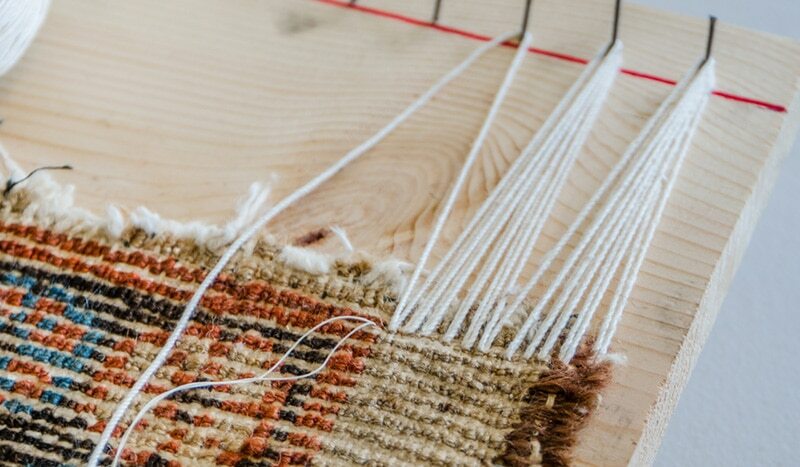 They’ll also select a method based on the overall condition of the fringe and rug type. Overcasting the rugs ends -this is the most cost friendly technique to re-secure the loosened fringes and those that have become displaced. Once the rug has been fully overcast and secured, the repair person will cut the fringes to a uniform length. Professional rug repairers often opt to do away with the old fringes and replace them by sewing a new “fake fringe” onto the rug if the rug has a thick pile. The Zangera stitch technique – this technique stitches one long thread along the rug’s entire end. This anchors and holds the ends in place – preventing further leavening. 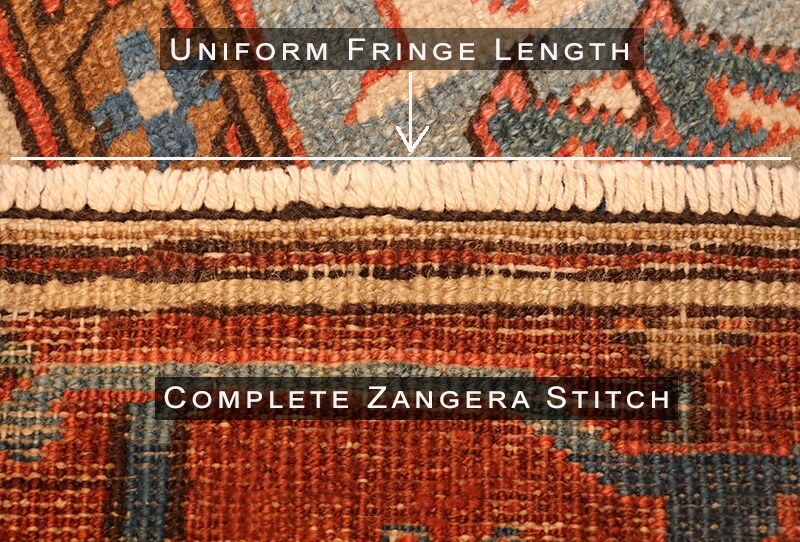 The Zangera stitch is usually the preferred method for thinner pile rugs. Yet another option is the implanted fringe technique in combination with the Zangera stitch technique. The Zangera stitch is used to secure implanted fringes and secure them from opening out. All the above restoration technique options will secure the rug and keep it from unraveling. They will also leave the rug looking more “complete” and beautifully preserved. As mentioned above, if damage to the ends and sides aren’t promptly corrected, the pile can unravel. As the pile is left to unravel further and further, the damage may become irreversible. Early intervention is imperative to keep rug repair costs down and ensure the damage doesn’t progress. If the unraveling is left unchecked, you may need to restore the carpet by re-knotting the lost areas over a newly constructed foundation before repairing the fringe. Of course, pile damage doesn’t have to necessarily start at the ends or sides. The pile of a rug may become low over time from wear and tear and the daily tread and pile compression. A low pile isn’t as severe and immediate a problem as fringe and side damages. That said, very low pile can still be an issue that can make the rug look and feel unhealthy. Over time and with continued lessening of the pile, the foundation of the rug may begin to get exposed. Once the pile is completely gone, and you are left walking on the foundation only, that foundation may break which can result in a life ending damage for the rug. The above said, some antique rug collectors feel that a low pile speaks to the character and age of the rug. They often choose not to initiate repairs and re-pile until absolutely critical to the rug’s life. But the early rugs and collectible carpets are a completely unique subset in the rug world. The fact that even the best rug restorer may not be able to provide an exact color match for rare and specialty rugs is also a deterrent for some rug enthusiasts against re-piling rugs. To repair a rug’s imperfections or not is a personal preference and judgement call. Look at how much traffic the rug endures. Speak with an expert repair person to determine if a color match is available, and, if not, discuss how close of a match can be obtained. 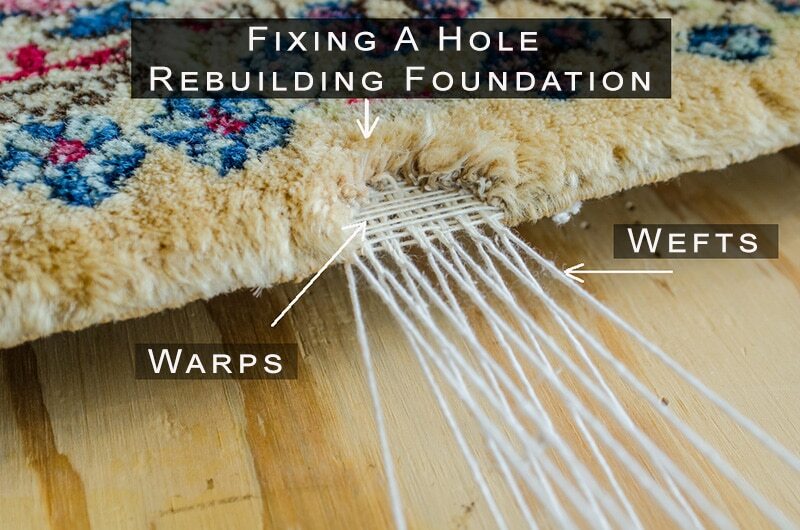 If the foundation of a rug ever becomes visible, repair is inevitable to preserve the piece. Before a hole in a rug may be repaired, the carpet will need to first be cleaned thoroughly by an expert. Once complete, the restoration and reweaving of the hole in the carpet can begin. Reweaving is a tedious three part process that requires great skill and care. The first step is to rebuild the lost foundation where the hole in the rug exists. Broken foundation fibers are repaired and extended so that they’re now able to be rewoven. This is a crucial process since an improperly laid foundation will deteriorate quickly and leave the rug in disrepair yet again. Weaving the wrong quality of foundation may also result in having to re-pile the area using a different size knot or even a completely different rug knotting technique. This will result in an “bad,” pronounced and obviously restored area. The second step involves knotting wool threads onto the newly created foundation where the hole used to be. Whatever density and pattern was used in creating the foundation should be continued to be knotted in the wool pile. 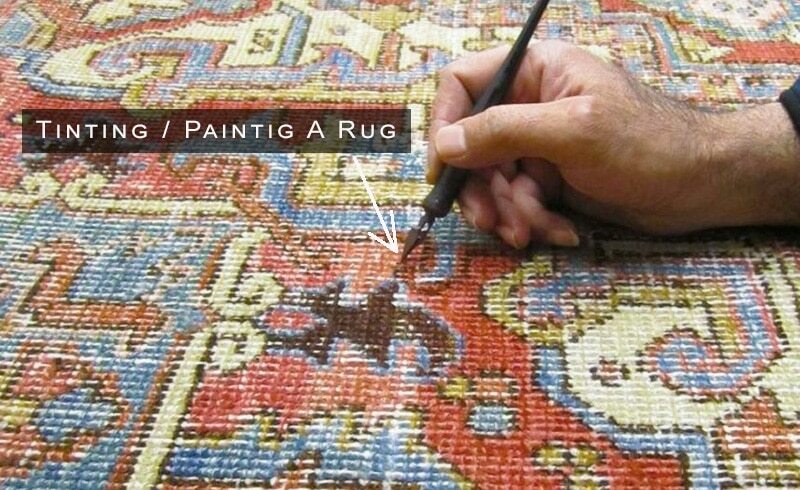 It takes a great deal of skill and labor to recreate the wefts, warps, knots,colors and patterns of the original rug. The final step is to shear the wool down so that the pile height of the restored hole area matches the rest of the rug. If done correctly, the repaired area where the hole used to be, will be almost indistinguishable from the other parts of the rug. 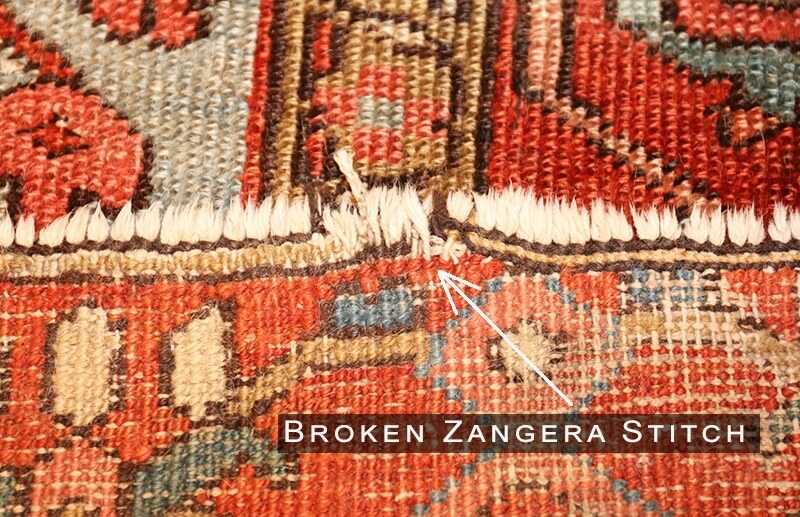 The importance of trusting this repair only to a seasoned, expert rug restorer cannot be stated adamantly enough. In closing, hopefully rug owners have learned more about the maintenance, care, restoration and repair of rugs. Almost any rug or carpet can be repaired or restored to a near original state. Don’t throw out used or old rugs thought to be too damaged to save. A professional restoration and repair expert may have a solution. Ask for a free restoration and repair assessment to help determine if the cost to value ratio is worth the investment. Remember that routine, regular maintenance and cleanings by a professional can avoid costly repairs and preserve the feel and look of rugs of all sizes and styles. Initiate carpet repairs quickly to avoid further and more costly damage to the rug. Only trust rugs to skilled, professional rug repair and restoration experts. Don’e be penny wise and pound foolish as a few extra dollars now may end up saving you a lot more money down the line. For any antique rug repairs and Oriental carpet restoration services, especially in the New New York City area, Please Contact Us. Such antique rug repair and restoration requires enormous technical skill and precision, as well as discernment in the matching of yarn, texture and color. This process requires expertise and a refined eye to match as well as possible the original texture of the carpet so that the repair will not be detectable. The extent of restoration that may be required in both in time and expense depends not only on condition, but also on the value of the carpet in relation to the cost of the repair. A knowledgeable dealer in antique carpets and vintage rugs with market expertise will make this decision. Such restoration can make a damaged piece usable and commercially viable once again. But ultimately the greatest reward in rug cleaning and repairing your antique Oriental rugs is the knowledge that a rare and beautiful work of art is being preserved for generations to come. The object of restoration is to remove the erosion of wear and other damage caused by years of use, by recreating portions of the carpet that are valuable and rare. Restoration requires the precise matching of yarn, color and shade. This process requires expertise, training and a refined eye to detect and restore the subtle changes in texture and coloration of the carpet. The extent of restoration, both in time and expense, depends solely on the value and rarity of the carpet. A knowledgeable dealer in antique carpets with a technical expertise in the commercial market will make this decision. Perhaps the greatest reward in repairing an Oriental carpet is the knowledge that a rare and beautiful work of art is being preserved for generations to come. Our staff is well trained and knowledgeable in various aspects of restoration, having mastered their skills through expert training and many years of experience. Nazmiyal is proud to have assembled master restorers under one roof to provide full services for the restoration of your valued carpets. For an estimate on the restoration of your carpet, feel free to contact us. 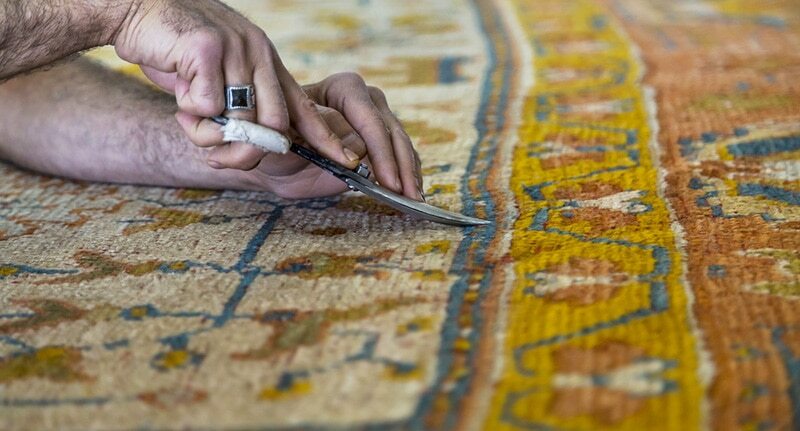 Antique Rug Restoration and Carpet Repair – For over 30 years, Nazmiyal has employed a group of highly skilled conservators specializing in antique rug repair and restoration services. 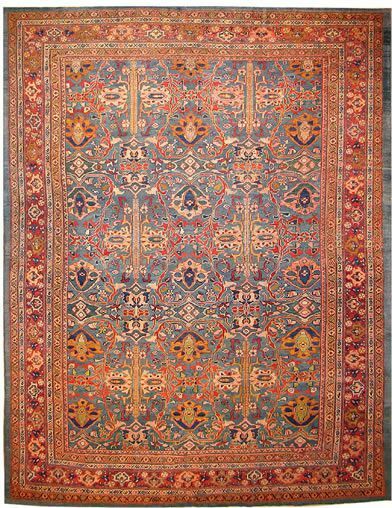 Caring for and preserving the beauty of antique Persian rugs and antique carpets, museum-quality carpets, hand-woven kilims and heirloom pieces is our specialty. Our experienced antique rug restoration professionals use traditional techniques to repair and revitalize the finest and most valuable antique carpets and kilims in the world. 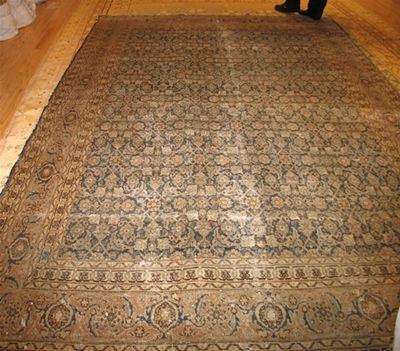 Our antique rug repair specialists work with many clients in New York City and the Tri-State area to undertake rug cleaning services, repairs and conservation efforts. Preserving the value of unique rugs, kilims and hand-woven textiles is our chief concern. Whether for monetary, artistic or simply sentimental reasons, an antique rug should be cleaned professionally to ensure longevity and to preserve its beauty. Before completing cleaning procedures or conservation efforts, the history, origin and condition of each piece is carefully evaluated to ensure all restoration efforts are sympathetic to the artistic and structural integrity of each rug or kilim. Regular cleanings and periodic maintenance are essential for preserving the beauty and structural integrity of antique Persian and vintage rugs. Minor repairs can benefit nearly all antique rugs. Repairing and reinforcing weak areas can prevent the damage from expanding, which can prolong the longevity of any antique rug. Our considerate approach to antique rug repair and restoration procedures allows us to create repairs that are nearly undetectable. Common restoration services include general cleanings, repairing fringes, recovering selvages and re-knotting damaged or missing patterns. When appropriate, we also undertake intensive repair and restoration efforts, including re-piling worn areas and rebuilding the warp and weft. Whether your rug was damaged recently or is simply showing the effects of age, we invite you to contact us about restoring your beloved antique Persian and Oriental rugs, heirlooms and investment pieces. Our staff is knowledgeable and competent in all aspects of restoration, having achieved their expertise through many years of training and experience. Nazmiyal is proud to have assembled a number of master restorers under one roof to provide a full range services for your valued carpets. 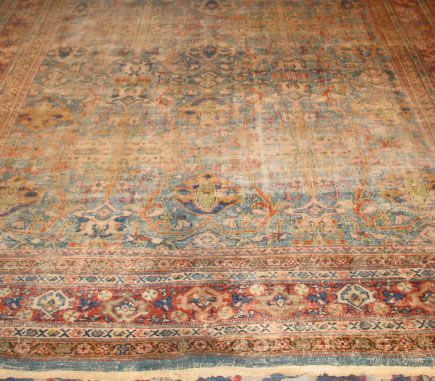 Antique Rug Repair and Restoration (Case Study) – While the rug repair and restoration of antique rugs requires skill and patience, the restoration of room-size carpets like this Tabriz presents a special challenge. The areas requiring repair are more extensive and scattered across a larger surface whose level and texture must be carefully matched, even though it may be somewhat low from years of use. The repairs must also be durable enough to stand up to the foot traffic that a decorative room sized rug will have. With the completion of the repairs, we can now enjoy the un-disrupted precision of its sweeping, meticulous design. After the restoration, the carpet has been brought back to life and could be used for many years to come. For the most part, if done well, the areas of the rug which have been restored are pretty much undetectable to people that are not in the rug trade. As with any antique piece, restoration is expected. If done properly, restoration will increase the value of the rug. Needless to see – it will increase the life span as well! While the repair of any carpet requires skill and patience, the restoration of room-size carpets like this Tabriz presents a special challenge. The areas requiring repair are more extensive and scattered across a larger surface whose level and texture must be carefully matched, even though it may be somewhat low from years of use. The repairs must also be durable enough to stand up to the foot traffic that a decorative room sized rug will have. With the completion of the repairs, we can now enjoy the disrupted precision of its sweeping, meticulous design. 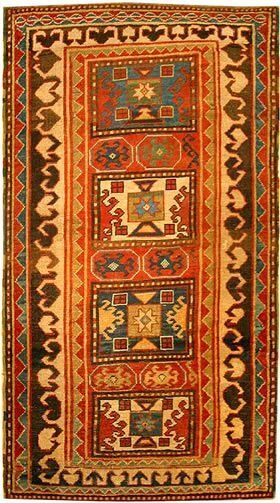 This lovely little Kazak rug was heavily worn in the center of the field. In spots the pile had disappeared completely, exposing the foundation of the rug, and in the adjacent areas the pile was rather low. The repair involved replacing the lowest areas of the pile as well as the areas where the pile was entirely gone, in order to bring the pile up to an even level consistent with the undamaged portions of the carpet. Such repairs are difficult and can only be accomplished successfully with the greatest skill and patience. But they have now fully restored the bold drawing and graphic color effects that originally gave the rug its appeal. When restoring antique oriental rugs, it’s important to go to someone who has a track record working on such pieces. Any antique rug can be restored but finding the right restoration person is key. Just like anything else, good restorers are not inexpensive, but in the hands of a master restorer, the rug can be brought back to life. When it comes to good antique rugs, in the hands of a professional repair person, there is almost nothing that can’t be undone or fixed so if something happened to your rug, do panic just yet, first contact a reputable restoration expert and hear what he / she has to say first. When we restore rugs here at Nazmiyal, we make sure to keep the original look and feel. Using the best materials and not cutting corners (pardon the pun) will ensure that your investment will remain safe and usable for years to come. The best restoration jobs are those that only a highly skilled expert would be able to notice. Just look at the before picture below, then compare it to the after image and see if you could what was restored and what remained untouched. We at Nazmiyal take pride in the restoration projects we do. Thanks to our skilled restorers, we are able to rejuvenate pieces that otherwise might have been lost forever! The two images below are an example of a restoration project that we took care of ourselves in house. 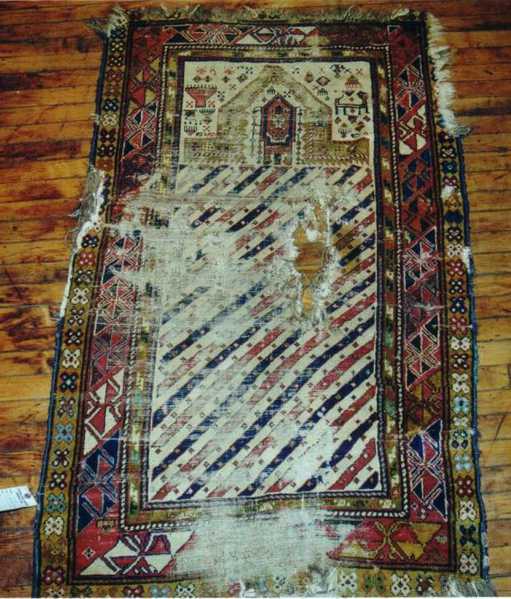 This charming Dagestan prayer rug was badly damaged. Not only was the pile worn to the foundations in the field and lower border, but there was also a large hole and substantial portions of the outer border were missing. This latter damage required rebuilding the foundation of the areas that were lost, and then re-piling them. The re-piling of the field was exceptionally difficult because the pile was low, and such low pile is the hardest to match or replace. Now we can once again enjoy the beauty of its design and color. This damage on this Kuba was not too extensive, but even such limited damage can be enough to spoil the effect of its fine, delicate design. The outer minor border or guard stripe had to be completely restored, and the scattered wear in the field needed to re-piled at a low yet even level. The result is remarkable. The crisp, jewel-like effect of the design has once again come to life. At Nazmiyal, we’ve dedicated years to preserving, restoring and cleaning oriental rugs and carpets to their original splendor and beauty. With each repair, one of our knowledgeable experts oversees the process to ensure that the texture and type of fabric used results in a seamless rug restoration. We are privileged to have several master restorers who work for us and who use their expertise to create exact recreations on antique carpets. 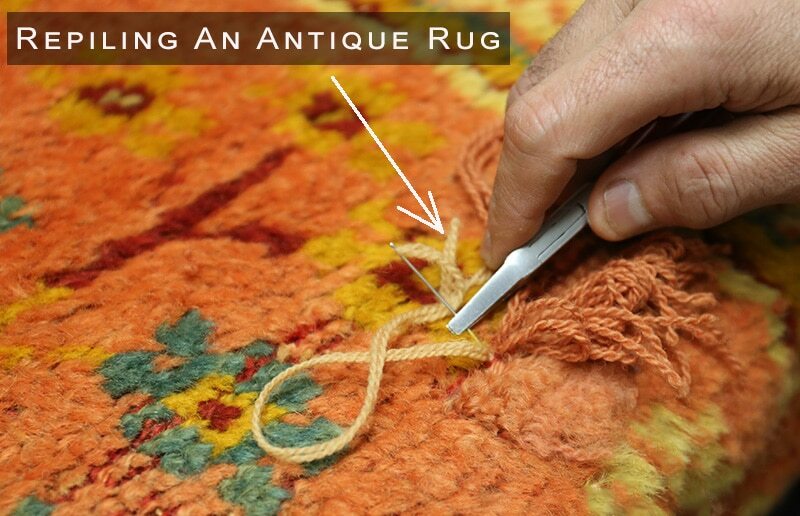 Each antique rug repair is unique, and we take a careful approach to ensure that the item’s originality is carefully preserved during the process. While some carpets and rugs just require reweaving the surface pile, our experts can also skillfully recreate the underlying foundation, as well. If you are in need of our antique rug repair services, please feel free to give us a call. We can easily be reached at 1 – 877 RUG FIND. One of our courteous staff members will be more than happy to discuss our restoration process with you and schedule a time for our experts to take a look at your carpet and begin the repair process. The time taken to repair your carpet depends largely on the extent of rug restoration that is necessary.